Located in Mykonos, Royal Myconian - Leading Hotels of the World is within a 15-minute drive of Mykonos Old Port and Elia Beach. 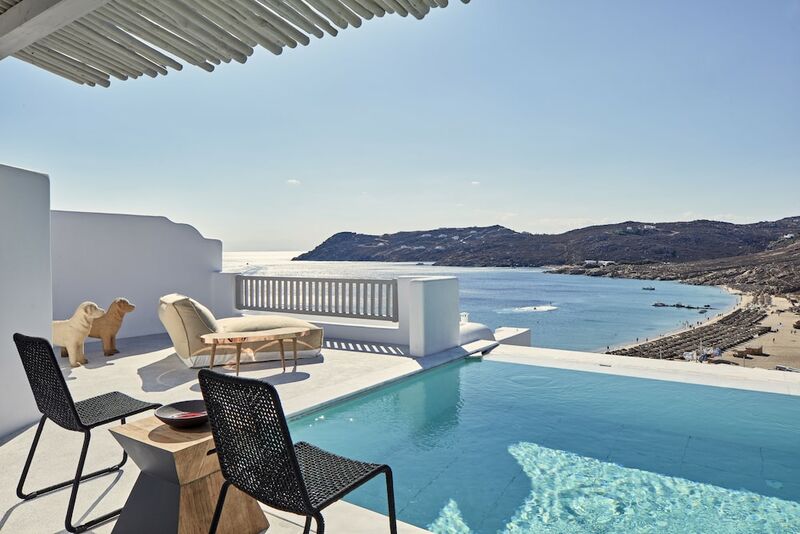 This 5-star hotel is 6.1 mi (9.9 km) from Super Paradise Beach and 8.4 mi (13.5 km) from Mykonos New Port. Make yourself at home in one of the 151 air-conditioned rooms featuring minibars. Conveniences include phones, as well as safes and complimentary bottled water. Be sure to enjoy recreational amenities, including an outdoor pool, a spa tub, and a sauna. Additional amenities at this hotel include complimentary wireless Internet access, babysitting/childcare (surcharge), and an arcade/game room. Enjoy Mediterranean cuisine at Elia Restaurant, a restaurant where you can take in the ocean view, or stay in and take advantage of the 24-hour room service. Relax with your favorite drink at the bar/lounge or the poolside bar. Featured amenities include a business center, a safe deposit box at the front desk, and coffee/tea in a common area. Self parking (subject to charges) is available onsite.